There is a great variety of different products and extra parts on the projection dome market, and this can make the process of choosing the right dome difficult and stressful. One extra part you can buy is a type of screen for geodesic domes. We talked to our experts to clear up any misunderstandings. We hope this will allow you to choose the best solution according to your dome usage and requirements. Depending on the size and the purpose of the dome you require, dome companies offer two types of screen for geodesic domes: tilted and non-tilted. Fulldome.pro provides a third unique type of screen: a non-tilted low screen. The tilted screen is a perfect solution for a cinematic experience. The tilted position of the screen is very convenient for any viewer, whether they are standing, sitting on chairs or beanbags, or right on the floor. The tilt of the screen means the viewer is in a very natural position, allowing them to enjoy the show and get a fully immersive experience. However, since the front part of the screen is quite low, visitors walking close to projectors in the dome can cast shadows onto the screen. For this reason, we do not recommend this type of screen for in-dome events. A tilted screen can be used in the domes of any size, and it is perfect for smaller domes. A screen like this is ideal for holding presentations, parties, and dance events inside a dome. The projection screen creates a live immersive spheric ceiling for the venue. The position of the screen allows visitors to walk around freely inside the dome without casting shadows. The non-tilted screen begins at a height of 2.2 meters from the floor. For this reason, this standard screen type starting from 10M (33ft) dome. The non-tilted low screen is a unique piece of technology that helps to create the most immersive in-dome experience. 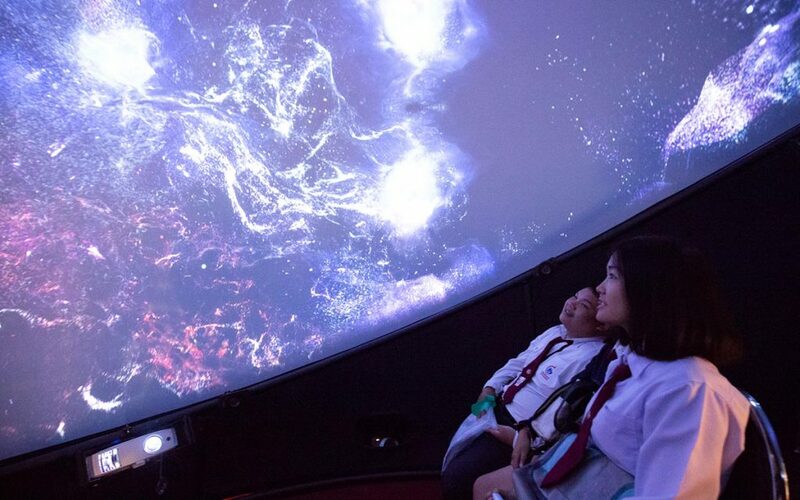 A dome with a screen like this is often called a VR Dome. The screen begins at a height of 40 cm from the floor, meaning viewers are fully involved in the content. The effect created by the screen makes this dome an affordable alternative to a 360 Dome. At the moment, this type of screen offers the most immersive experience of all dome screens. However, viewer capacity is limited due to the type of projection system. This type of dome screen type starting from 7M (23ft) dome.